Recounts were ordered Saturday in elections for U.S. Senate, governor and agricultural commissioner, giving the state’s 67 elections departments five days to once again tally more than 8.2 million combined ballots. Florida rewrote laws and overhauled voting procedures in the wake of the disastrous 2000 presidential election to ensure the process would be smoother and more predictable the next time a close election triggered a statewide recount. Recounts were ordered Saturday in elections for U.S. Senate, governor and agricultural commissioner, giving the state's 67 elections departments five days to once again tally more than 8.2 million combined ballots cast over an entire month leading up to Tuesday's midterms. Florida Secretary of State Ken Detzner called for automatic machine recounts after receiving unofficial vote tallies at noon. It was not his choice: Statewide contests decided by a half a percentage point or less must be reanalyzed under Florida law, and the races between Gov. Rick Scott and U.S. Sen. Bill Nelson, Ron DeSantis and Tallahassee Mayor Andrew Gillum, and state Rep. Matt Caldwell and Nikki Fried were all within razon-thin margins. The total vote count reported by the state on its website after receiving the unofficial final tallies showed DeSantis leading Gillum by 33,684 votes, a difference of 0.41 percent; Scott leading Nelson by 12,562 votes, a difference of 0.15 percent, and Fried leading Caldwell by 5,326 votes, a difference of 0.06 percent. In all three cases Saturday, the candidates in the lead declared victory. "I am honored by the trust that Floridians have placed in me to serve as your next governor," said DeSantis, who called the results "clear and unambiguous," in a videotaped statement. "With the election behind us, it's now time to come together as a state as we prepare to serve all Floridians." Though recounts rarely change the results of elections, nothing is settled yet and 8,302,983 ballots must be recounted and resubmitted to the state by 3 p.m. Thursday before Detzner can certify any results. Any contests still within a quarter of a percentage point will then be forced to undergo a hand recount. Paul Lux, the supervisor of elections in Okaloosa County and president of the Florida State Association of Supervisors of Elections, said the state's supervisors have all been preparing for days for the recounts ordered Saturday. He said the state is better prepared than it was 18 years ago — when a recount of ballots in the race between George W. Bush and Al Gore paralyzed the entire country — thanks to uniformity in ballots and vote tabulation systems and new laws regulating statewide recounts. "Unlike 2000, this time we all have the same playbook," Lux said. Detzner's recount order applies to the entire state. But most eyes will be on South Florida, where late-developing returns in the four days after the election dramatically shrank already-tight margins for Republican frontrunners and, in Caldwell's case, took him from the lead to the rear. Scott's campaign has filed lawsuits against Broward Supervisor Brenda Snipes and her Palm Beach counterpart, Susan Bucher, alleging noncompliance with state public-records and elections laws. Caldwell has also sued Snipes. Amid unproven claims of ballot-stuffing, protestors have camped outside Snipes' Lauderhill elections headquarters for two days. Snipes, who has heckled by critics as she worked to count hundreds of ballots Saturday ahead of the state's deadline, said the recount would begin Sunday after her department's ballot counting machines are re-calibrated. The county, which also has to recount four local elections, will run more than 700,000 ballots through its machines, which will recount all three races in one pass. In Miami-Dade, Elections Supervisor Christina White began recounting ballots at 5 p.m. Saturday. She is planning 24-hour shifts to recount the 800,000 ballots cast in the state's most populous county. White has ordered high-speed ballot counting machines from Omaha to add to the eight the county already owns. They're expected to arrive Monday, and White said the machines are crucial for Miami-Dade to meet the Thursday afternoon deadline for completing the recount and having its new results tallied by the state. "This is a monumental task that no doubt will be done," said White. Hillsborough and Pinellas counties begin their marchine recounts tomorrow. During the process, each ballot has to be scanned at least once. Any ballot that is problematic for a race being recounted — if the machine detects votes for multiple candidates or no votes — will be kicked out and scanned again to identify the race with the potential flaw. 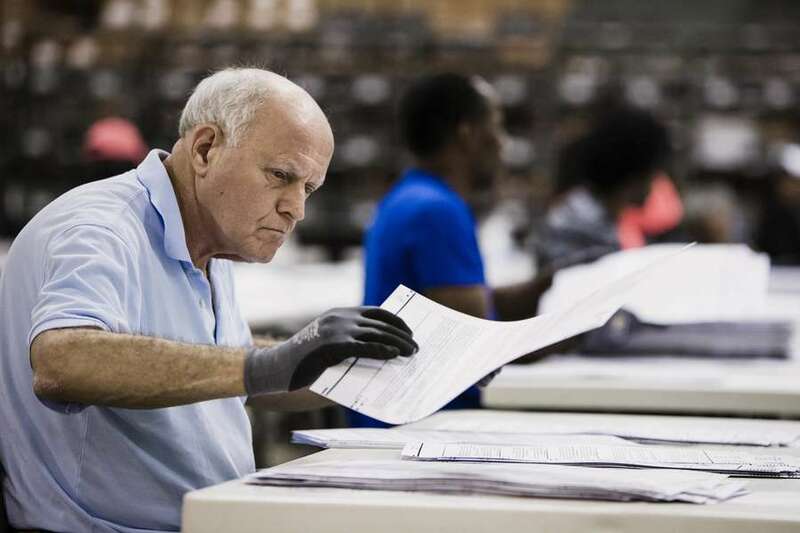 Once elections supervisors send their recount totals back to the state, Detzner may order a manual recount for any race within a quarter of a percentage point. That process, during which canvassing boards review ballots where voters either skipped a race or voted for too many candidates, would need to be completed by Nov. 18. Currently, based on unofficial totals, the U.S. Senate race between Scott and Nelson and the race for commissioner of agriculture will likely need to be decided following manual recounts. Detzner could decline to order manual recounts if the losing candidates ask that the election be ended, or if the number of votes to be recounted is less than the number of votes needed to change the outcome of the race. For trailing candidates, making it to a manual recount is crucial. In Nelson's case, for instance, his campaign believes machine error led to some 24,000 under-votes in Broward County alone. Another 10,000 undervotes in the U.S. Senate race — unusual for a contest at the top of the ticket — exist in Miami-Dade. Nelson attorney Marc Elias said the campaign is also looking into the scores of absentee ballots that were left in an Opa-locka postal service distribution center, although elections staff say they've been assured that none of those ballots were post-marked by voters in time to meet a 7 p.m. election night deadline to be counted. Additionally, Nelson has filed a lawsuit in federal court in Tallahassee in the hopes of invalidating the state's process of rejecting mail-in ballots and provisional ballots with signatures that don't match voters' signatures on file. Elias said the flawed process was on full display in Broward County Saturday when the canvassing board accepted a stack of 205 provisional ballots that included some 22 ballots that had been prematurely removed from envelopes containing mismatched signatures that were later flagged by the board. "This is an example why signature matching is such a disfavored technique," said Elias, who agreed with the canvassing board's decision to include the entire batch in its tally to the state. "Is it really a rational and fair result to say let's throw out 205 ballots? In what way is the equitable remedy there to throw out all the votes?" In what may be a sign of things to come, Scott's attorneys objected to the inclusion of those 205 ballots by Broward County. When the Miami Herald reported on the issue, Lieutenant Governor Carlos Lopez-Cantera tweeted that Snipes was allowing illegal votes. "This," he said, "is madness." Scott, meanwhile, declared victory and called on Nelson "to accept reality and spare the state of the Florida the time, expense and discord of a recount." His campaign said no recount since 2000 has closed a margin like the one that exists in the race. And Gillum, who conceded the race Tuesday night, retracted that concession in a tweet. He appeared with attorney Barry Richard, a lawyer who represented Bush in 2000, and said every legitimate vote should be counted regardless of whether it makes him governor or not. Richard wouldn't predict whether Gillum will make it to a recount, but did say this about the recount process: "It's far, far less complicated than it was in 2000. The votes are either there, or they're not there." Times/Herald Tallahassee Bureau staff writers Elizabeth Koh and Samantha J. Gross and Miami Herald reporters Sarah Blaskey, Kyra Gurney, Caitlin Ostroff and Martin Vassolo contributed to this report.